I find that a variety of the blogs that I would really like to see on these lists often get overlooked. Often, a fair amount of the mainstream blogs and their content is meant for those starting out in the marketing industry. That’s not a bad thing. These are important lessons, and there are plenty of social media marketers out there that are just starting out and could use this information. But as a result, intermediate and advanced marketers often struggle to find quality, in-depth and useful content. I’ve always shared my opinion on this in the comments on these type posts, talking about how there are far too many blogs out there that are never mentioned. I saw a similar article on Buffer, and shared my thoughts in the comments of that post. 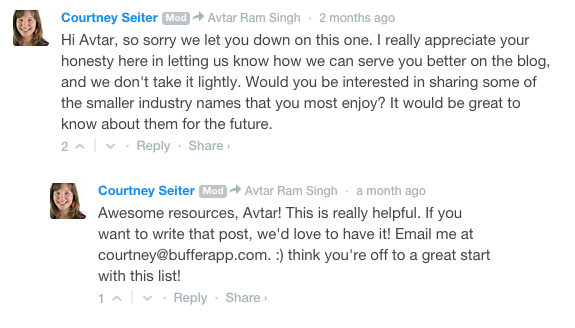 After I offered up some feedback on Buffer’s list of marketing blogs to follow, Courtney solidified the amazing Buffer spirit by asking me to put together my own list! Over the last month, we exchanged a few e-mails and now here we are! Let me expand a little on that last one. If a marketer spends 20 minutes reading your content, what do they get out of it? Is this piece of content worth someone spending 20 minutes reading and absorbing? Will this article somehow help a marketer accomplish their goal? At the end of the year, when the marketer has his yearly assessment in the organization, will this article provide knowledge that will have a positive effect on the outcome of the assessment? Will this article make the marketer come back to my blog every day? Have I actually talked about something new here, or has this already been discussed plenty of times? If this has been discussed plenty of times, is my outlook on the situation refreshing and something that will help the community? It might seem impossible to answer all of these questions in the affirmative, but the 10 blogs below repeatedly do all of the above. Interested in keeping tabs on all these sites? 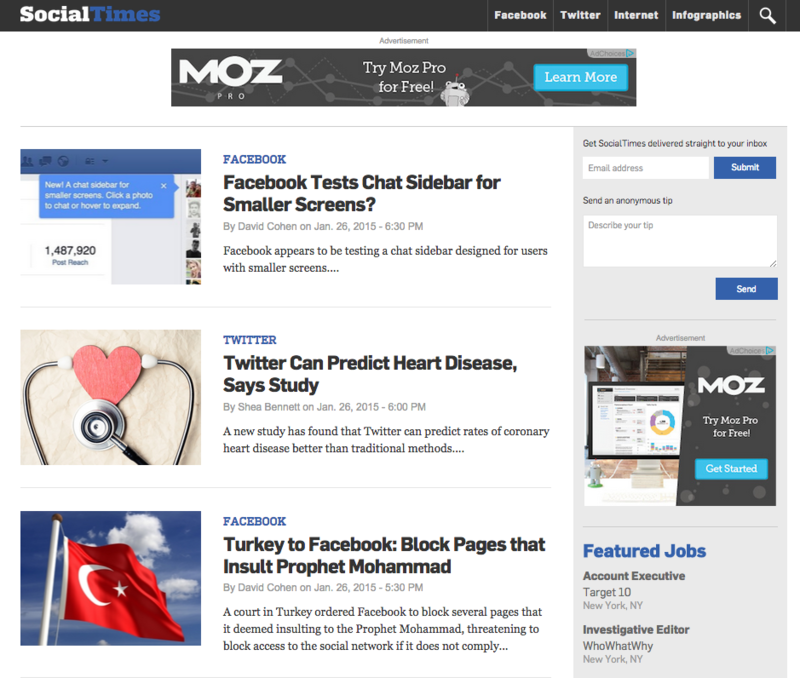 Go here to add them all to your Feedly account in one click! First things first – I’ve left Buffer off of this list. It’s obviously not because I don’t think the Buffer blog should be here, but it’s because, well—you’re already here. You know Buffer, you know that Buffer has quality content, you know you can count on Kevan, Courtney and the amazing Buffer team and contributors to continually produce a stream of amazing, useful and actionable social and marketing content. With that out of the way, these, in no particular order, are my favorite marketing blogs, and ten that I believe deserve a lot more love and recognition from the marketing community. Mark Schaefer is no small fish in the marketing world. He has a continuous stream of fantastic articles that are all fresh, thought-provoking and often based on Mark’s experience with massive brands. Posts here range from list-based articles on things you can do to be a better marketer to trends you should be focusing on, to 200 word short-snippets about Mark’s conversation with someone in the industry who challenged his beliefs. His most famous piece of content (in my mind) is Content Shock. He challenges the belief that content marketing is the way forward, and puts forth a very sound and concrete argument about content marketing by sticking to the basics of economics—supply and demand. The post garnered a massive outcry from the content marketing community, and the 350+ comments on that post attracted the bigwigs of the content marketing industry that came to protect their livelihood as Mark stood by his words and backed up his points time and time again. That post made me a fan, and since then Businesses Grow is probably the first blog on which I look for new content every day. 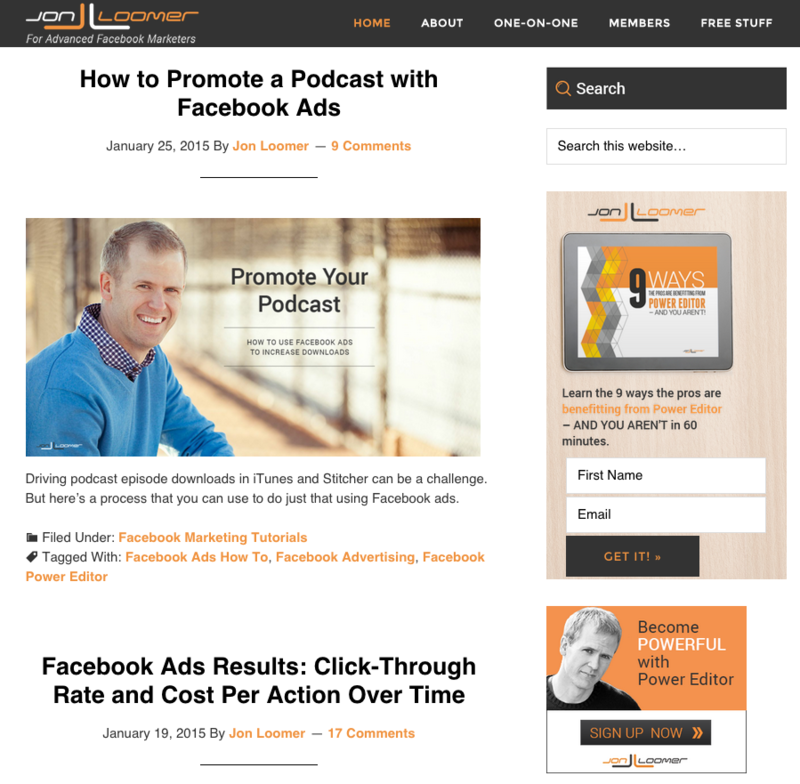 Jon Loomer is a Facebook ad expert. And that’s an understatement. The best thing about Jon’s Facebook advertising blog is that he’s always happy to share numbers. Dollar values. Most marketing blogs talk about how you should spend your money, how you should segment your audience, what you should do with your Facebook ad sets and what the best practices are. But Jon, in addition to doing all of that, literally puts his money where his mouth is and tests out his recommendations and shares the Facebook ad reports. He tells you that website clicks from Audience A cost him $X, and website clicks from Audience B cost him $Y. Like a true influencer should, Jon shares thought-provoking ideas about Facebook advertising and talks about new ways to get your audience to notice you. Whenever Facebook announces a change in their advertising platform or introduces a new feature, I wait till Jon posts about it and shares his insights. More often than not – within a day or so he’s actually used it, tested it and shared his results. And more importantly, when there are updates to the platform, he goes back and edits the post to make sure it reflects the current platform. When I was thinking about putting together this list, I had both InsideFacebook and AllFacebook listed here. David Cohen and Justin Lafferty have combined these two blogs into the SocialTimes section of AdWeek. Most of the posts here aren’t “thought-leadership” articles, but are in fact news-based articles, with a mix of the top news from around the industry thrown in for good measure. I follow this blog to stay on top of the news. Facebook’s made newsfeed changes, Twitter has launched a new feature in their ad-platform, Pinterest just revealed interesting data, Instagram has added on another 100 million users or Tumblr hired a new COO. Most of the articles here also have a little bit of insight from Justin, David and the rest of the contributors at SocialTimes. It’s vital for marketers to stay up to date with the latest information, trends and news, and SocialTimes does a fantastic job of delivering that to you. 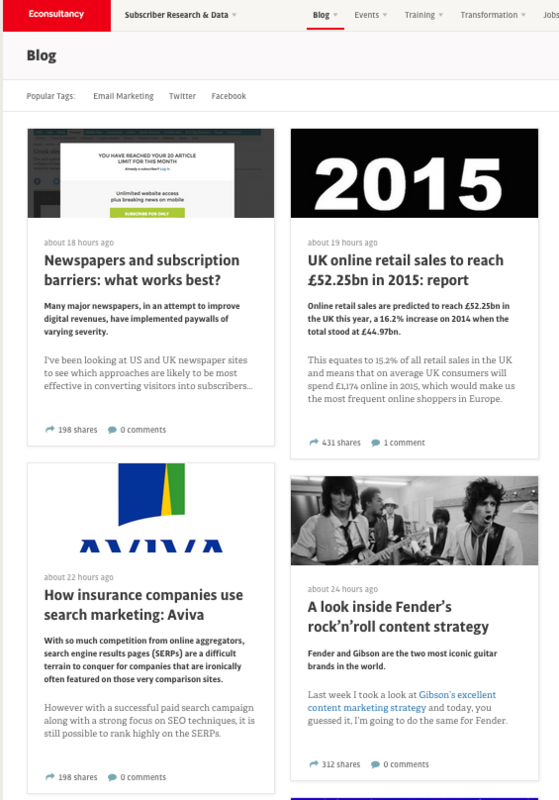 eConsultancy has a ton of data-driven posts and example-driven posts. The majority of what they post is actionable and rooted in the real world, giving you examples of what other brands and companies are doing to supercharge their marketing. eConsultancy also create their own research reports, from which they showcase certain bits and chunks of data that can be a massive help when you’re trying to come up for some solid reasoning behind your content and social strategy. Don’t follow eConsultancy if you’re looking for lightweight articles that you can read on the bus or train ride home—you’ll need to perhaps make notes when going through them! Recommended Article: Why do People Abandon Online Travel Bookings? eMarketer is my no-nonsense data reporting pal. Don’t expect these posts to contain analysis and interpretation, because you’ll seldom find that. They report the data to you, and that’s all that matters. They do however, always couple their reports with some interesting forecasts. Almost all their growth charts (at present) pan out till about 2018, giving you an indication of what they feel will grow and how much it’ll grow by. To me, their policy seems to be: here’s the data, you make sense of it and decide if it’s worth your while. Your clients and senior management are always interested about the future, and if possible, want you to show some numbers to support your strategy for the next year (or more). 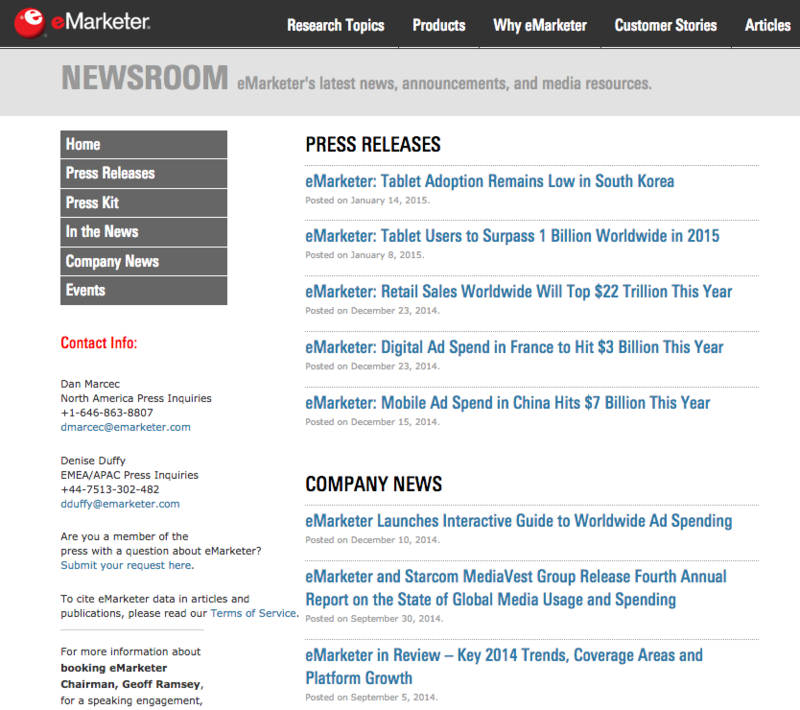 eMarketer does a great job of giving you all of this and more. When it comes to SEO, most people head straight for Moz, Marketing Land, Search Engine Land and the rest, which is awesome. But more love should be given to Stone Temple Consulting’s blog, a firm that has been providing SEO Consulting Services for 10+ years. 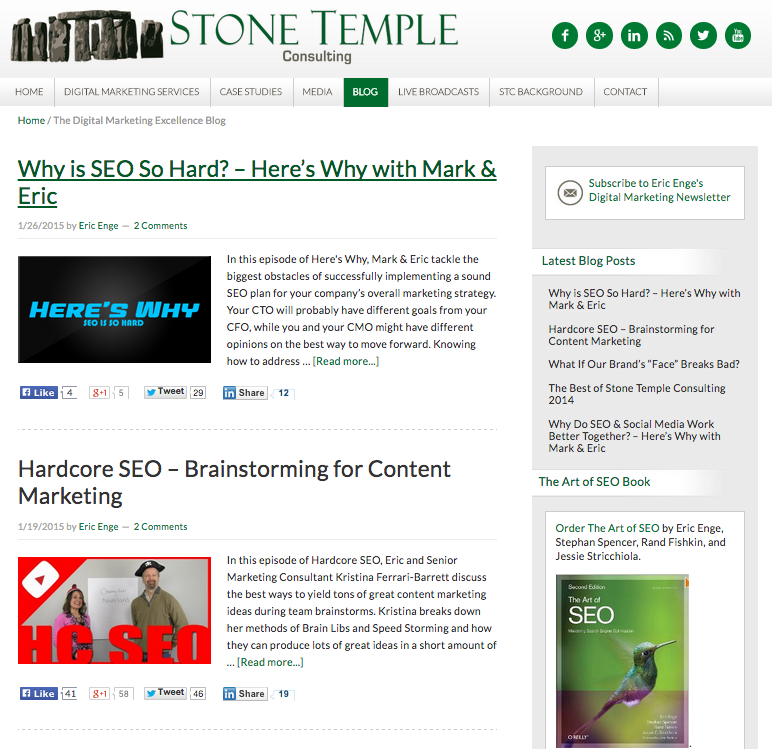 Spearheaded by Eric Enge and Mark Traphagen, Stone Temple Consulting has a weekly flow of great content centered mostly around SEO. The thing I like the most about Stone Temple’s blog is that they provide straight advice about SEO in a very “business-ready” manner. The reasoning behind their logic and suggestions is very clear to you, no matter how long you’ve been in SEO. Their advice is usually based on their own research, studies and what they have found conducting practical tests. 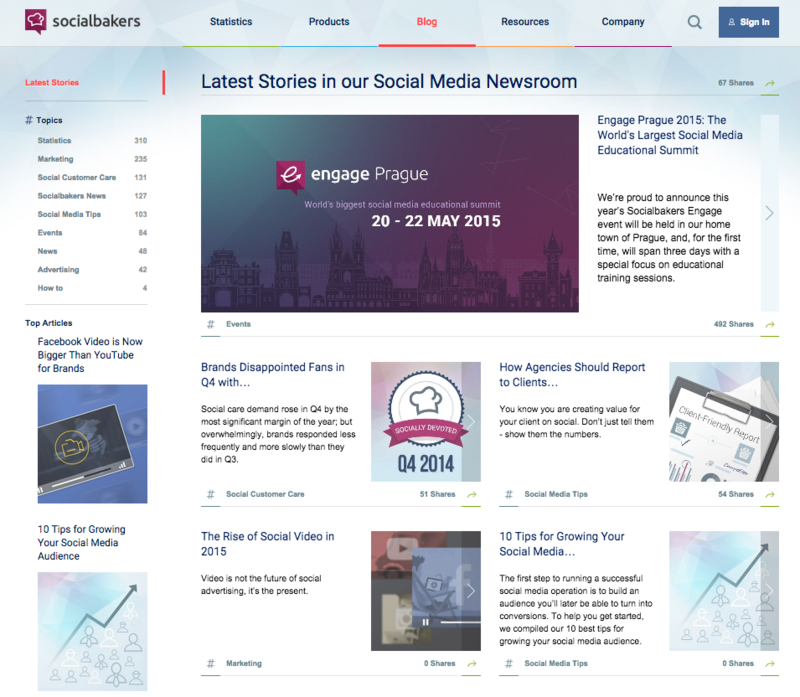 With an absolute trove of data and possibly the largest collection of social media analytics on the planet, Socialbakers shares some incredibly useful content on their blog. Social marketing, or any other marketing for that matter – eventually comes down to the cold hard numbers. And Socialbakers gives you the numbers. With monthly reports on Instagram and Facebook, they tell you which brands are performing the best on these platforms and what strategies they’re using. Their regular Social Customer Care reports talk about the state of customer care in social and let you know which brands are better at providing customer care via Facebook. It gives you insight into the best brand’s best practices, allowing you to study them, learn from them—and incorporate them in your own practices. Do you like trends? 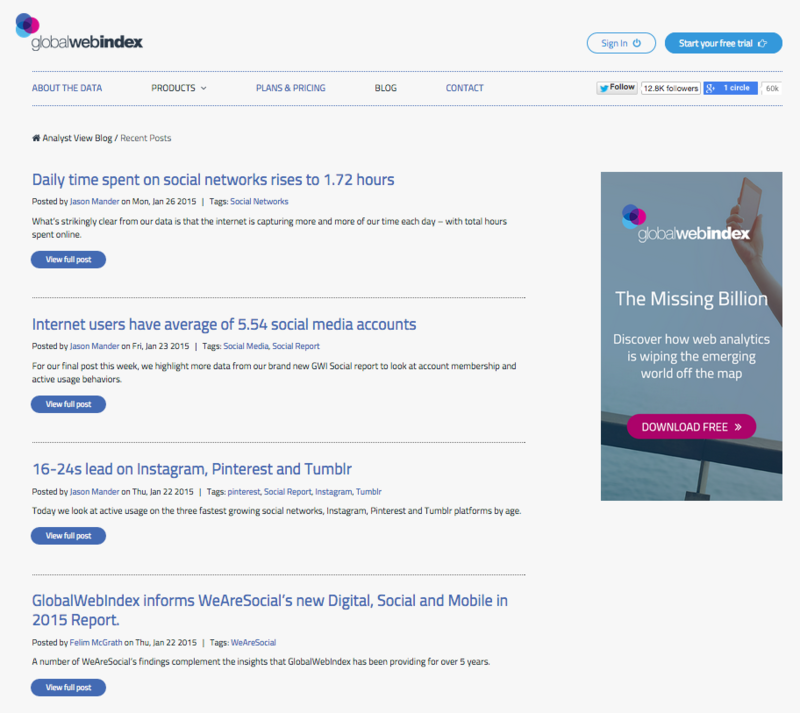 You’ll love GlobalWebIndex. There was a time when I would share almost every single chart GlobalWebIndex released on my LinkedIn and Google+ streams. I would always get incredible interaction on them, lots of questions and a lot of discussion. If you talk about the right metrics, you get the right response. And GlobalWebIndex does a great job of talking about the right metrics and the right figures. The thing about GWI is that they give you over-arching figures that inform you about shifts in certain trends and demographics. What’s SnapChat’s user base like? How much has SnapChat grown compared to WhatsApp? What’s the average age of people on Tumblr and how much time do they spend on the platform? 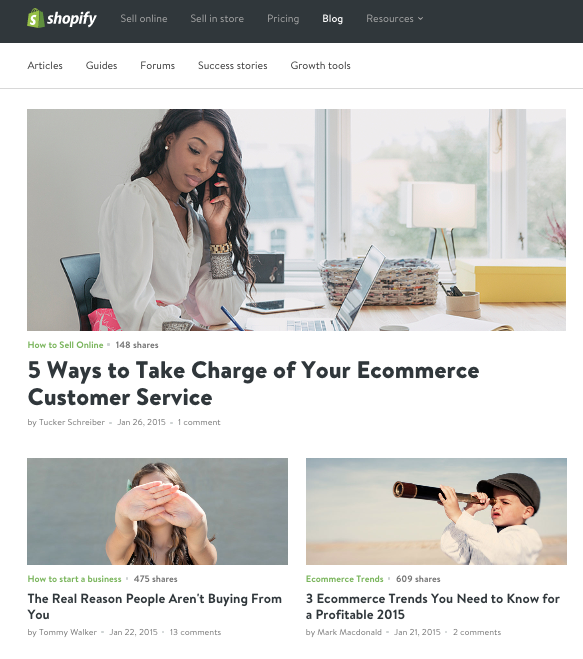 An e-commerce web solution, Shopify takes its content marketing incredibly seriously and has worked hard to build a community of e-commerce marketers. I first came across a piece of content from Shopify when they broke down visitors by social media network and showed which ones bought more. My jaw dropped. It was by far one of the most insightful and useful pieces of content I had seen that year. Shopify’s regular content focuses on optimization of e-commerce platforms for better conversion rates, but they build a great amount of content around larger topics, such as cashing in on major customer trends, analyzing buying behavior, and creating the right images to inspire people to buy and showcase your products. While Shopify’s main target audience is probably people that are running an actual online store, every single marketer can gain a wealth of knowledge from their very useful content. Recommended Article: Which Social Media Platforms Drive the Most Sales? 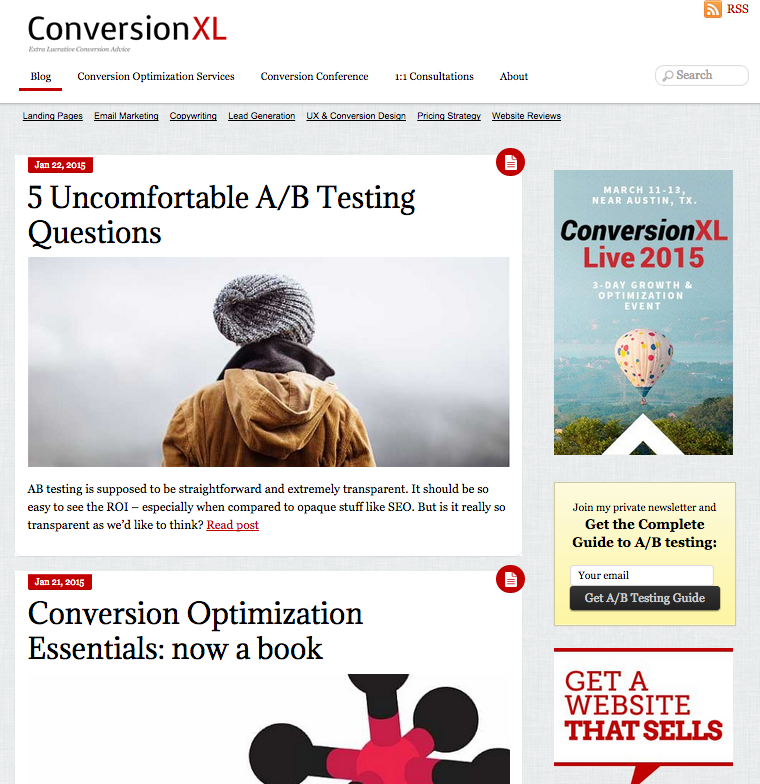 Initially, ConversionXL was the place I used to go to tell myself that there are far too many marketers out there who will always be better than I am. And that’s the challenge. ConversionXL tends to be a little “heavy” for some users because the content dives into deep analytics, testing and conversion. It’s not for the faint of heart. I used to be nervous going through the paragraphs of content on ConversionXL, because I was in awe of exactly how much testing these guys can do to optimize their campaigns and to make sure that every single dollar spent is spent logically and you can trace ROI back to every cent. Their content can be a little hard to follow, and often overwhelming, but advanced marketers always pump their fists in the air when they see a new post up on the platform. These 10 blogs are just my personal picks, and no list is perfect. There are most definitely a lot more blogs out there that are doing amazing things and adding great value for their radars. If I have missed out on a blog that deserves to be here, tell me about it in the comments! Someone who enjoys crafting content and user experiences, Avtar splits his time managing digital, social and content strategy for brands and cheering Tottenham Hotspur. He’s an EDM and Sci-Fi fan, and is often mistaken for Ryan Gosling and Charlize Theron, depending on how he’s wearing his hair that day. Find him on Twitter, @AvtarRamSingh.